Do you find it hard to keep rooms in your house warm or cool? Is there an unusual draft you feel every now and then in certain areas? What about your utility bills? Have they gone up for no apparent reason? If you’re experiencing these problems, there is a chance you need your attic insulated. With poor insulation in place, the warm air that costs you so much money can easily find its way out of your home. Similarly, during hot summer days, heat may infiltrate through your vulnerable attic and force you to run the AC non-stop. Luckily, our skilled team in Irvine will make sure your attic is properly insulated, without causing too much obstruction or jeopardizing the safety of you and your loved ones. 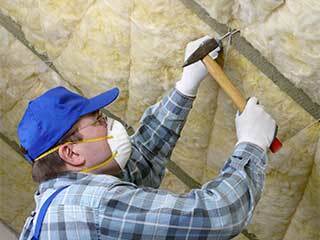 There are several types of attic insulation: blankets of insulation (fiberglass and rockwool), blown-in insulation (cellulose and fiberglass), foam board insulation, and spray foam insulation. Each of these types has its advantages and works differently. Our company will make sure to lay down your options on the table and advise you on the most suitable method for your home. Depending on your needs, we will either remove and replace your old insulation or install a new one. Sometimes, both processes may be due. One of the newest ways to insulate your home is by using radiant barrier technology. After our technicians are finished with installing a radiant barrier, your home will benefit from more efficient energy usage. The barrier will reflect the direct heat back from its source during the summer days and keep the warm air within your home when cold, winter days arrive. The effectiveness of a radiant barrier will depend on its E-value, instead of the standard R-value. This is a number between 0 and 1 which determines how much radiant heat the material absorbs and how much it reflects. Our team will ensure you enjoy the maximum benefits of this type of insulation with E-value that suits your home.